In many cases, when you purchase a solid surface countertop the holes are already drilled to allow for the installation of faucets. However, this is not a rule. If you purchased a solid slab of stone for your countertop, you need to drill out the holes. Because many holes require holes larger than 1-inch in diameter, you will need specialized drill bits called "hole-saw drill bits." Since you are drilling through stone, you need a hole-saw bit with a diamond tip or one designed for masonry. This will ensure you can drill your hole large enough and without destroying your countertop. 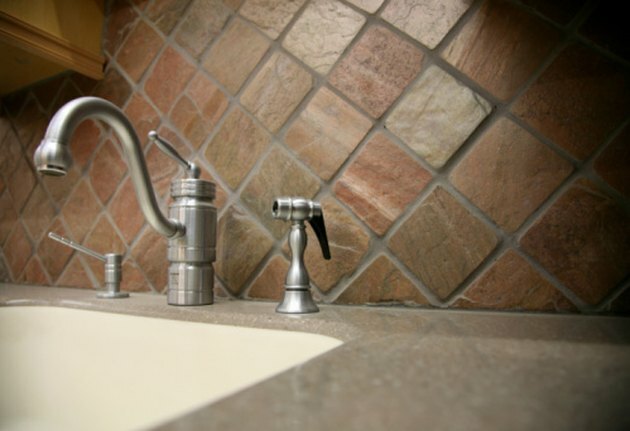 You need holes in your countertop to mount faucets. Place a piece of masking tape over the surface of the countertop where you want to drill the hole. Masking tape prevents the drill front slipping around and provides a surface that you can easily mark. Measure the location where you want to drill the hole. Measure twice, cut once is a very important rule when drilling into expensive stone countertops. Place an X on the tape where you want to drill. Drip the drill bit located in the center of the hole-saw and the tip of the hole-saw into a container of cutting oil. Place the tip of the drill bit over the X, set your drill speed between 100 and 200 revolutions per minute and hold the drill bit at a 90-degree angle to the countertop. If the hole is too close to the backsplash to allow you to hold the drill at a 90-degree angle, use a right angle hand drill. Turn on the drill and apply slight downward pressure on the drill. Allow the cutter to do the work, do not force the bit through the material. Pour a small amount of cutting fluid around the edge of the hole-saw as it goes into the material. This will help to keep the saw cool. Continue this until you break through to the other side.